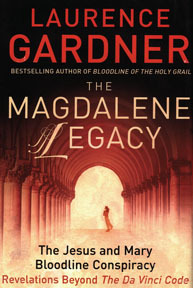 Gardner’s explosive historical detective story, presenting secret archives on the mysterious life of Mary Magdalene, the hidden lineage of Jesus and Mary, and the real 2,000-year-old conspiracy involving the entire history of Christianity. Mary Magdalene is described in the New Testament as Jesus' close companion—a woman that he loved, and his financial sponsor. And yet, in contrast, the Catholic Church teaches that she was a prostitute who became repentant. Why the discrepancy between scripture and dogma? Why does Mary appeal so romantically to artists, who have painted her throughout the centuries as something much more significant than the Church traditionally portrays? What is the secret of Mary Magdalene and how much do we really know about her relationship with Jesus? Were they married? Did they have children, and if so, who makes up the messianic lineage? Laurence Gardner's takes us on a detective trail to piece together the true controversial significance of the Magdalene and its astonishing implications: the allegorical portrayals of Leonardo da Vinci, including Mary's coded appearance in The Last Supper—the sacred marriage of Jesus and Mary—the enigmatic Templar society called The Priory of Sion apparently formed to protect the Jesus/Mary secret marital relationship and descendants—the truth behind the Knights Templar—who they were and what their role was—the hidden gospel of the Magdalene, excluded from the New Testament canon Her life and exile in France—the forbidden tomb: the secret resting place of Mary Magdalene—the significance of the Magdalene to the history of Christianity. Published at $24.95, our price only $18.95!